On October 5, 2018, Island Records/UMe will release the 30th anniversary, 2-CD deluxe edition of ANTHRAX’s fourth studio album, State of Euphoria. The package will consist of two discs: Disc One is the fully-remastered album, all of the B-sides originally released in conjunction with the album, and “Antisocial” recorded live in London at the Hammersmith Odeon in March, 1989; Disc Two, “Charlie’s Archives”, is a real treasure trove for ANTHRAX fans as it puts you right in the room with the band as the album’s songs evolved. The package also includes a 20-page booklet that will take you right back to the time of the album’s release. State of Euphoria will also be issued as a 2-LP set on standard black vinyl and limited edition red and yellow colored vinyl. Both versions are available for pre-order now. 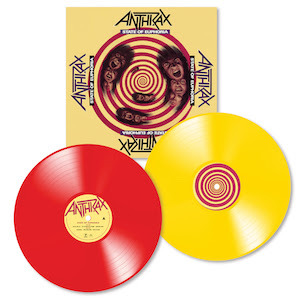 The anniversary package was helmed by the band’s drummer and long-time archivist Charlie Benante, who dove into his ANTHRAX vault to come up with the tapes that show the evolution of the album’s songs. Disc Two takes you through the writing, development and recording process of the album’s songs. The listener is taken into the band’s writing and rehearsal sessions hearing the band members construct the song, deciding what stays and what doesn't, and then into the studio for the recording of basic tracks. “We recorded everything back then,” said Benante. “We would sit in the rehearsal room with a little two-track machine. record everything we did in rehearsal while we were putting the songs together.” Also pulled from his vault were tapes of the actual recording sessions, all the takes, that also appear on Disc Two. In addition to the original album’s artwork that includes the Mort Drucker-drawn (Mad Magazine) back cover, the anniversary package includes never before seen personal snapshots of the band members, tour admats/posters, plus two ANTHRAX magazine covers, all culled from that 1988-1989 period. For the booklet, the band enlisted British journalist Alexander Milas, former editor-in-chief of Metal Hammer, to write the sleeve notes, Shawn Franklin handled editing tracks and Paul Logus mastered the set. Benante also took to social media, inviting fans to tell him what State of Euphoria had meant to them. He was overwhelmed with responses, and many of them are included in the booklet. “I think fans will be really excited when they see their own quotes in the package,” Benante added. State of Euphoria was produced by ANTHRAX and Mark Dodson, includes fan-favorites “Antisocial” and “Be All, End All", and was certified Gold a few months after release.